The launch of Nokia 6.1 Plus smartphone of HMD Global can be done in India on August 21. 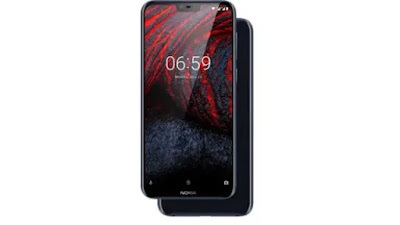 In China, this phone was launched in the name of Nokia X6 in May. HMD Global has sent media invoices for launch in India. It is expected that the company will launch Nokia 6.1 Plus in the event on August 21. Recently, the company released a Smartphone's teaser in India. At the same time, when Nokia 6.1 Plus was launched in Hong Kong, its price was 2288 HKD (about 20,000). However, no information about this phone will be priced in India. With Nokia 6.1 Plus smartphone, HMD Global can also offer Nokia 5.1 Plus, Nokia X5, and Nokia 2.1 in India on August 21. Even before, the company has been launching many phones at the same event. As mentioned, the Nokia 6.1 Plus price in the Hong Kong market is HKD 2,288 (approximately Rs. 20,000). In comparison, the Nokia X6 was priced at CNY 1,299 (approx. Rs. 13,800) for the 4GB RAM/ 32GB storage variant and CNY 1,499 (approx. Rs. 16,000) for the 4GB RAM/ 64GB storage variant, while the 6GB RAM/ 64GB storage variant was priced at CNY 1,699 (approx. Rs. 18,100). Speaking of the specification of this phone, it comes with dual sim (Nano) support. The Nokia 6.1 phone is the smartphone that works on the Android 8.1 Oreo. The customer will be given a 5.8-inch full HD (1080 × 2280 pixels) display. There will be a ratio of 19: 9. Nokia 6.1 Plus features the Octa-Core Qualcomm Snapdragon 636 SOC processor. It comes with 4 GB RAM. The phone has dual rear camera setup. It comes with a dual rear camera with 16 megapixels as a primary sensor and a 5 megapixels secondary sensor. In addition, the selfie camera company has given 16 megapixels. This phone also supports the Face Unlock feature. Coming to storage, Nokia 6.1 has 64GB of onboard storage and is expandable via micro SD card (up to 400GB). If we talk about connectivity, there is 4G Volte, Wi-Fi 802.11ac, Bluetooth v5.0, GPS/ A-GPS, a 3.5mm headphone jack, and a USB Type-C port. It comes with a good battery backup that last long with a capacity of 3060mAh battery and measures 147.2x70.98x7.99mm.